Producers David Heyman and David Barron exclusively revealed to MTV News today that, yes, a Harry Potter documentary is in the works. See the video and some details below. Heyman and Barron told us that Morgan Matthews, an award-winning British filmmaker, shot the "Potter" documentary on the set of "Deathly Hallows," which means that the doc is as current as it's going to get when it comes to the magical mythos. From tragic deaths to happy endings, this documentary should run the whole "Potter" gamut from start to finish. Matthews had full access to key creative talents both behind the scenes and in front of the cameras in the "Potter" universe, resulting in "a documentary that is not yet complete" but should contain memorable interactions with your favorite stars. Don't bank on a happy-go-lucky "Potter" documentary. Just as the series gets progressively darker, Matthews' work chronicles all of the emotions that go into the filmmaking process: "[It] shows the challenges of making the film — the tolls it takes on the actors and crew," says Heyman. "It's not just pure gloss and everybody's happy. It's real. At the same time, it's really, really funny. 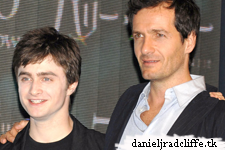 To give fans a sense of what's in store in this "Potter" documentary, Heyman teased an exchange between Matthews and star Daniel Radcliffe: "Morgan comes in to interview Dan in his dressing room, and Dan says, 'Will you wait one second? I want to watch the 2:50 at Doncaster,' which is a horse race. He says, 'Yeah, I bet on it.' 'How much?' 'Ten quid.' And the horse, of course, comes in way behind the back."